Caroll Stoner at a dress rehearsal with students for the Elizabeth Haddon Elementary School Talent Show that she has been directing for 18 years. 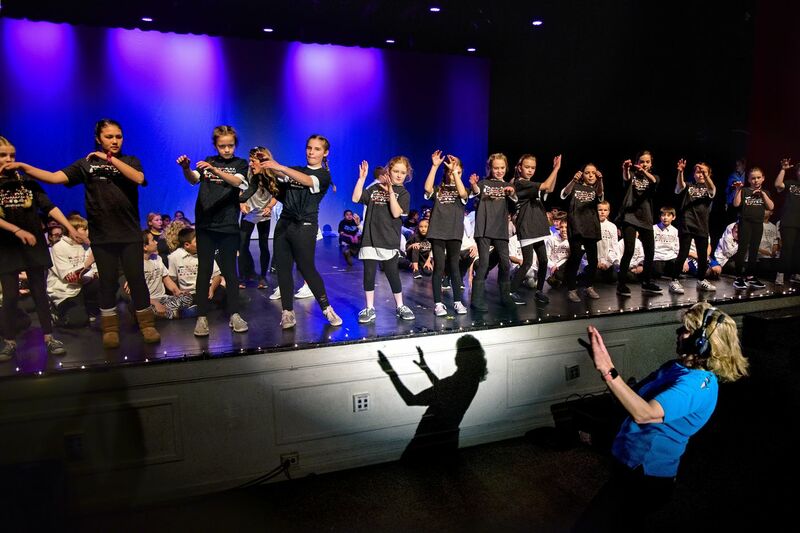 Boys wore dresses, teachers danced across the stage and the principal Gerry Bissinger of Elizabeth Haddon Elementary School emerged to Queen’s We Are The Champions, exciting the audience of the sold-out talent show in Haddonfield. At the end of it all, Caroll Stoner – who has directed the show for 18 years – thanked all those who supported her ambitions for elaborate productions as all five of her children have participated. She did not disappoint with Friday night’s show as about 130 kids took to the stage, including a sibling duet by Kai Freeman playing violin and sister, Miya, behind a grand piano playing The Entertainer. Three generations of Stoners were in the audience, including Stoner’s parents and her oldest daughter, Julia, who flew back from Seattle. Stoner took an interest nearly two decades ago when she sat in a cramped auditorium to watch Julia perform. “Well, this could be better,” Caroll Stoner thought when her third-grade daughter took the stage. As fate would have it, the then-director was stepping down. Stoner volunteered, beginning her 18-year run in which all five of her children performed. She transformed the show into an $8,000 annual production with professional lighting and sound, funded through tickets for sold-out shows and program advertising. Friday, as the curtain went up for this year’s show, it was a swan song of sorts. Stoner’s fifth-grade son, Brandon, is graduating from the elementary school, and he and his mom will took their final bows in what has become one of the most elaborate school talent shows in the region. Caroll Stoner gives her fifth grade son, Brandon, 11, a high-five as they rehearse for Friday's Elizabeth Haddon Elementary School Talent Show. “It feels like it’s time,” Stoner, 55, said during a recent interview. She will miss it, but is glad to pass the directing on to another mom, Liz Barrett, who has been at Stoner’s side in recent years learning choreography, lighting, and special effects for an audience of 950. It’s also a family affair, as volunteers include Stoner’s husband, Jeff, and their children, who helped with the show long after they left elementary school. Stoner emphasizes organization. She sends eight-page emails to parents highlighted with the most important instructions, like, “I must have your music by the end of the day Friday, March 8.” Practices — there are at least seven — are mandatory. About 130 third- through fifth-grade students are participating this year. Over the years, there have been singers who have gone professional and a violinist who wowed audiences. “I’m pretty close to a fine oiled machine,” Stoner said. Each show has a theme. Her favorites were the 1980s, and those with an American theme. This year’s theme is Through the Decades. Stoner said the most memorable soloist over the years was Giana Caruso, who had professional voice lessons and whose sequined dress shimmered under the stage lights, with the spotlight following her into the audience as she belted out Roar. A year later, Giana sang This Girl’s on Fire while playing a grand piano that Stoner had delivered to the school. Caroll Stoner leads students in dance. It’s highly unusual to have one person stay on for 18 years, to have an elaborate production for an elementary school, and to have such strong support from students, parents, and the community, said Lani Harac of School Family Media, an educational company in Massachusetts that assists schools in finding resources for programs such as talent shows. Carol Stoner at one of her last practices for the Elizabeth Haddon Talent Show. Stoner is not without training. She holds a business degree from Eastern University, secured a patent for a holiday ornament organizer she sold on QVC, and made it to the tryouts for Shark Tank. With the talent show, she combines her business and creative skills. “It’s magnificent how she does this,” said Jami Harting, whose two children were in this year’s show. The family went to New Orleans recently, and got permission from Stoner to miss a practice. While there are grumblings about the strict rules and the amount of practice required, parents say they respect Stoner’s decisions because the show is polished and performers leave the stage glowing. Fifth grader Tommy Grookett performed Friday in a group for the third year, dancing to an act called the Roaring Twenties, wearing a tux and top hat. His group had 11 practices before this week’s dress rehearsals. “It’s definitely worth it because of how much fun it is to get up there with all my friends and perform in front of such a large crowd,” he said. There have been close calls. In 2002, Stoner’s first show, when it was time for Julia Stoner’s solo, her mom had misplaced the CD with the music.